My name is Marie Bou Aziz. I was born in Nice, France and moved to the United States when I was 4. 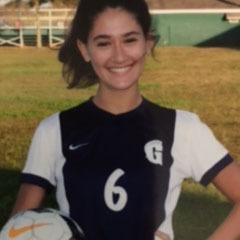 I am a soccer player and will be graduating from Gulliver Preparatory in 2019. I am a starter on the Gulliver Varsity Team. I am currently in the International Baccalaureate Program and taking AP classes. I am a member of the Health Information Project, better known as HIP, a program where we teach 9th graders about health topics usually not talked about and taught in ordinary classes. I am also an officer in the French Honor Society as well as National Honor Society. Furthermore, I am involved in several clubs such as GOALS, Smiling Tummies, Dance Club and French Club. I started playing soccer when I was 6, and have always had a passion and commitment to the sport. I was on the Pinecrest Premier 2001 Blue Team, which has consistently been ranked in the top 10. After a year playing for Coral Gables Storm 01 I just moved to Sunrise Sting 00/01. Marie is a 2019 central midfielder who can play the 6, 8 or 10. Marie is a bright, technical player who has awareness of her teammates and has a high work rate. Marie will continue to improve as she works on increasing her speed of play. Marie is an excellent student who is looking for an academic match for soccer.